Ducted air conditioning systems, whether for residential or commercial purposes, are a great choice if you want to condition the air in more than one room or area. Ducted air conditioning systems are some of the most energy efficient solutions for maintaining the perfect home temperature. They come in a range of capacities (5kW to 25kW) to deliver the power needed to service any size home. Whilst any system of 18kW or more does not operate on single phase power, as licensed electricians we can advise and quote for the necessary installation of 3 phase power into your home. Whichever power level is required, you will be guaranteed a completely discrete air conditioning system. Supply and return air grilles will be carefully located around your home to blend in with your décor or simply be hidden from sight. Download the Daikin AC systems ducted air conditioners brochure for details on the full range of residential use systems on offer. Browse through everything from inverter, non-inverter and hybrid models to low, mid and high level static. We install air conditioning systems of all power levels and capacities! Need help to choose what's right for you? The Daikin ducted air conditioning system is made up of both indoor and outdoor units. The indoor unit can be installed either in your roof cavity, or if access allows, under your flooring. If installation coincides with construction or renovation or the fancoil can be installed under the home, pipes and cables are hidden in the walls to connect the two units discretely. If installed after construction, the pipes and cables can be run down the sides of the structure inside Colorbond trunking that matches the downpipes for a cohesive look. Once your ideal unit location is selected, ceiling, floor and wall grilles are discretely placed around the house to disperse conditioned air evenly. In the case of a roof cavity installed unit, droppers are used to run ducts through to downstairs; they can be hidden in wardrobes and boxed into walls to blend into their surroundings. One of the best features of ducted systems is the inclusion of ‘zoning’ options to allow you to keep some areas conditioned, while others that are not being used can be turned off. This saves on both energy consumption and money so wherever you are, your perfect comfort conditions follow you. This wonderfully convenient and intelligent feature is managed by the Zone Controller panel. Daikin’s Zone Controller makes it simple to control up to 8 individual areas. It is designed specifically to meet the needs of the Australian market and is manufactured right here in Sydney. Clear backlighting and easy labelling make it simple and easy to use any time of day or night. Peninsula Air Conditioning is committed to delivering and installing the best systems possible. Instead of the standard R0.6, we use R1.0 insulated duct. It is well above industry required specs but used with your needs in mind. Roof cavity installed systems can be subjected to temperatures exceeding 50C in the summer and with R0.6 this can result in a reduced ability to maintain desired temperatures. R1.0 on the other hand will protect the delivery system from higher air temperatures ensuring that the conditions created at the heart of the system are exactly the conditions carried through all the ducts and into the desired rooms. Without this, either the quality of air delivery will suffer, or your system will have to work extra hard to maintain the desired levels of comfort. This in turn means a negative impact on your system’s energy efficiency and an equally negative financial cost for running it. It is important to realise that actual duct thickness is not the crucial factor here. You can have a very thick duct with an R0.6 rating and equally, a thinner duct with R1.0. Don’t make the mistake of thinking that thicker insulation automatically means more efficiency, it is the rating that counts above all else. Daikin controller. Control your system from anywhere in the world. Daikin ducted air conditioning features make for a more comfortable environment. Integrated back lit LCD zone controller for the best aesthetics. Up to two controllers per system. Night quiet mode makes for undisturbed sleep for everyone. Large selection of grilles allowing total flexibility to fit in with your interior décor. Superior materials: Purtech return air grilles, R1.0 duct, Exact Air Regulators. Stainless steel brackets look good and last longer. Electrical isolators for all systems. The unique features of Daikin ducted air conditioning systems are what set this brand apart from the rest. Daikin is a truly superior product. Just released to the market, Daikin’s Airbase BRP15B61 interface uses app technology for convenient remote control of your air conditioning system. 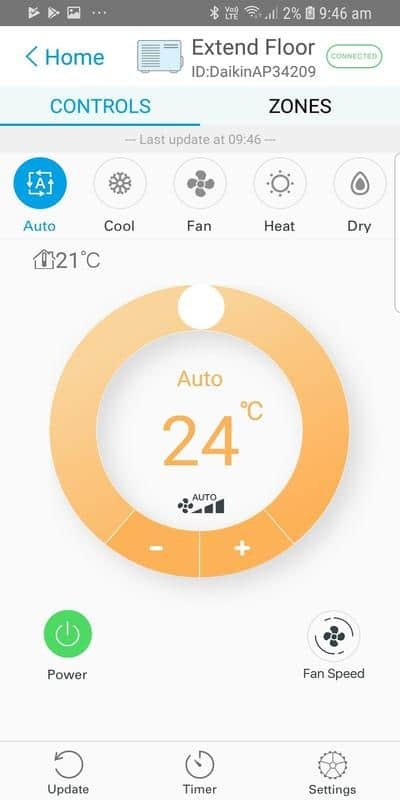 Download the free app from your Apple or Android store to gain control of your ducted air conditioning system using only your phone and an internet connection. You can then control your home system from anywhere in the world. Matching the airflow speed of your system to your ducting configuration is vital for optimal performance. The variable speed DC motor, with high powered permanent magnets, comes with 15 different fan speed settings to achieve this invaluable function. The induced magnetism employed by conventional AC motors simply cannot deliver the same level of control. The Auto Mode of Super Inverter ducted air conditioning system is constantly learning your preferences. It factors in indoor and outdoor temperatures and uses its memory of your past activity to pick the perfect comfort conditions for you. Even when you’re not manually setting the conditions, the system is working to keep you comfortable while saving you money on your energy bill. The increased power at start up used by the Daikin Super Inverter means humidity levels are controlled to meet your comfort needs swiftly after turning the air conditioning on. You won't have to wait around staying sticky for long. There’s no sleep interruption with the Daikin silent mode – for you OR your neighbours! Set your outdoor unit to operate extra quietly at night so everyone around you can sleep soundly in your ideal airy environment. These are far superior to the standard 'egg crate' type grilles. They are easier to install, extremely quiet and come with a fine nylon mesh filter that will last for years. The most versatile in the world. The opposed blade dampers (OBD) can be set at differing degrees of open and shut allowing the exact amount of air needed to reach the desired temperature. A system should be balanced using dampers in the ductwork in order to increase or decrease the airflow to each of the outlets until an even distribution of air is achieved in each room. The standard method of air management is the use of metal or blow-moulded fittings and damper bodies. The conventional damper bodies have a circular internal section called a 'scoop'. When the 'scoop' is moved by an external handle it rotates more open or closed to increase or decrease the air flow. However, this damper is limited - once the 'scoop' starts to impact on the airflow it creates a great deal of resistance very quickly, limiting the effectiveness. The 'scoop' is also commonly fastened with a nut which can, over the life of the system, loosen due to air pressure and render the damper useless unless constantly adjusted. What sets the Exact Air Regulators apart from the rest is the accuracy of the Opposed Blade Dampers, or OBD's. They are a linear balancing method that provides smoother and quieter airflow that distributes air across the duct more evenly. They provide for proportional air control that conventional 'scoop' type damper blades are no match for, and have 21 different locked positions that will not move over time. Isolator Switches on outdoor units. An isolator switch enables you to switch off the main power to the air conditioning system without having to find the main power source in your fuse box. Switching off the system may be required if you are going away for long periods or if the system has malfunctioned. We use Colorbond Trunking, not plastic capping. This trunking is used to cover all pipes and cables; using Colorbond trunking enables us to match this with other Colorbond products used on the exterior of your home such as downpipes and roofing. Outdoor units are either placed on polyslabs or brackets. Wherever possible we use stainless steel brackets because they look better and have excellent corrosion resistance properties. However it is not always possible to use stainless steel brackets on larger outdoor units due to their strength. If this is the case then galvanised brackets will be used instead. Need a quote or advice on the best system for you? Get in touch! I had no hesitation in calling on Peninsula Air Conditioning to install 2 air conditioners in my home, as they had installed one for my elderly father 7 years ago and there was never a moment's trouble with it. The installers were efficient, clean and courteous. There was a minimum of disruption while the units were installed. We are very happy with the finished job. Fabulous service from quotation to installation - completely professional and efficient. I highly recommend the service and congratulate Chard and his team for a job well done. I was impressed from the very beginning. Scott arrived on time, scouted out the work, and discussed the options open to us. The response time and quote were prompt and the team who installed it were quick and efficient. At the completion of the work they cleaned up the site and spent some time ensuring that we knew all the operating procedures for the unit, and assured us that should any help be needed they were only a phone call away. I have already recommended the company to friends. We received three quotes, Peninsula was not the cheapest of the three but we were impressed with the professionalism and the advice we received from the estimator. Basically, no added costs and the reassurance of repairs and service when required. Being local also helped. The 4 units and the decommissioning of an old unit were done with care and consideration to what we wanted. The workmen were tidy and professional and nothing seemed to be much trouble. The actual clean up after the construction was impressive also. We were extremely impressed by the efficiency of PenAir from the very first contact, then the quoting process and installation. We were very impressed with not just the high quality of their work but also the friendly and collaborative nature of the team. Highly recommend them! The air conditioner installation team were professional, friendly, neat and thorough. I highly recommend them. The team from Peninsula Air have just completed a great install in our two storey house. The whole process was easy - from the quote (given us all the info we needed) through to the install (very efficient). They even left the place cleaner than they found it. Loving our new Daikin too - so quiet, you don't even know that it is on (except for the fact the temperature is perfect). It was a pleasure to deal with Rod and his team. Communication was excellent. A very smooth process from start to finish. The work was carried out quickly and efficiently at the time agreed to. No problems at all. Great quality product. Great people and service. Highly recommended. Efficiently carried out from quote to installation, on time and to budget. We have a fabulous new aircon system in our Manly apartment thanks to the Penair team. They are a total pleasure to deal with. A team of very capable installers who clearly know their stuff were totally professional. We are delighted and happy to recommend Peninsula Air. I was very impressed with not just the high quality of their work but also the friendly and collaborative nature of the guys that recently replaced the 2 air con units at my home. A great job. Just had a ducted system installed. A job another supplier said would not take the 12.5 kw system with 8 zones due to the pitch in my roof. The Peninsula team assessed the position and whilst acknowledging that it was very tight, worked together as a team and obtained the result..
All who worked on the job were professional, friendly, worked quickly and efficiently and cleaned up after themselves. They also took the time to explain and answer questions. Peninsula is lucky to have a group of employees who are passionate in what they do and place their customers first. I can highly recommend them.